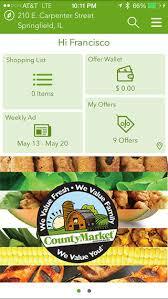 You have probably seen the ads for the new My County Market phone app. It's a brand new feature for our stores. It came out two months ago and I'm just now starting to see the benefits of having it on my phone. One reason is that I have an older smartphone, the other reason is that I'm slow to try new things. I loaded the app right away, but have just started opening it while I shop in the past few weeks. That is key to saving money with this particular app. You have to open it up while you are shopping in the store. The My County Market app actually learns what you want to buy and formulates offers as it gets to know you. If you do not turn the app on while shopping it will keep offering you the same product sponsonored deals. "Ah Ha" moment. As I shopped two weeks ago I did not redeem too many offers into my shopping wallet, this past week I grabbed up $8. Big difference in my shopping total and in the types of offers that are coming my way. Coupon shoppers are always saying that they want coupons for the products they buy most. This app does that It keeps track of the deals you want, and offers you similar ones. I almost always buy grapes and bananas for my son. He can pack away healthy snack like these by the pound. So this week, it offered me a discount on grapes. LOVE this app! It actually saw that I purchase grapes on a regular basis and encouraged me to purchase more. It also must have been paying attention when I bought goods for a picnic a few weeks back because it offered me deals on some of the staples I usually pick up when planning a cook out. Nathan's hot dogs, Lays chips and ketchup popped up as offers. I did not need them again so soon, but it was kind of nice to see that the offers were customized for me. Then there were the fluke deals. I was offered a cereal deal for additional $1 off, it was on sale this week, and I had planned to purchase it with a printed manufacturer's coupon. By the time the $4 cereal was on sale for $3, and I got an offer for $1 and used a coupon for $.75 I was over 65% savings on this item. What a lovely surprise for a coupon shopper. Are you ready to give it a try? All you need to do is download the app and be sure to enter your max card number. Turn it on as you enter the store next time you shop. You'll see the savings start to stack up for you in about 3 weeks. Plus, it makes shopping more fun. Enjoy. Visit County Market Coupon News Cookin w Coupons's profile on Pinterest. All internet coupon print limits are subjective. At the time of this email coupons were available for print. If the daily or weekly print limit has been reached, the coupon will be automatically pulled from the websites. You can try to print again tomorrow. All coupons listed are not available in our stores. We list them so you can order or find them to save you money. Check with clipping services, trade boards, or ebay to find coupons not in your store. It is our intent to help you find as many savings opportunities as possible. Enjoy!